Jean Baptiste Proulx was born in Lachine, Lower Canada on May 8th, 1808. Ordained a priest on July 26th, 1835 in Montreal, Fr. Proulx was sent to the Penetanguishene area to minister to the growing Catholic population. He also worked until 1845 with the First Nations peoples on Manitoulin Island. In 1846, he was transferred to the Toronto region, eventually settling in Oshawa where he ministered from St. Gregory the Great parish from 1848-1860. It was during this time, Fr. Proulx requested that a mission be established in Highland Creek, eastern Scarborough – thus the beginnings of St. Joseph’s parish. Fr. Proulx went on to be named Dean of St. Michael’s Cathedral in Toronto, a position he retained until his unexpected death in 1881. Apart from being a prodigious worker, Fr. Proulx was known for his pastoral kindness. He had a great impact on the First Nations peoples in the Manitoulin region and his contribution to the Archdiocese of Toronto is felt to this day. In the spring of 1854, the Right Reverend Armand Francois Marie, Comte de Charbonnel, second Bishop of Toronto, received the following letter from Father John Baptist Proulx, in charge of the mission of Oshawa: "...my Lord. ...since upwards of five years I do say Mass and hear the confessions in private houses, in the township of Scarborough, and that sometimes with great inconveniences. There is a great number of Catholics. They all wish to have a church erected in the township. A good man has offered one acre of land in a beautiful section eleven miles from Toronto, eleven miles from Duffin Creek (Pickering) and twenty-two miles from Oshawa... I hope, my Lord, that you will grant us the permission of building and permit me to go on with it as soon as possible..."
Permission was granted Father Proulx by Bishop de Charbonnel, the property purchased in that year of 1854 and the first steps were taken by voluntary labour, but the little church did not see completion until 1856. During the time of the building Father Proulx was saying Mass in the nearby home of a 'Mr. Walsh'. So began the story of the present parish of St. Joseph's of Highland Creek. Queen Victoria was then in the 17th year of her reign; the Crimean War was just beginning and Toronto, a city of about 40,000 inhabitants, alternated with Quebec as the capital of Canada. The streets were lit with gas, the sidewalks were of planks and the roads were being macadamized. Steamers left the Toronto wharf three times a week for Rochester, calling at Whitby, Oshawa, Darlington, Bond Head, Port Hope and Cobourg; but the first railroad in Western Ontario, the Ontario, Simcoe and Huron Railway, was already in operation, having opened the first section, from Toronto to Aurora, the year before. Eighteen-Fifty-Four was a Marian Year. The doctrine of the Immaculate Conception was to be declared a Matter of Faith on December 8th of that year and already preparations were being made in the Diocese to celebrate this solemn event with suitable ceremony. It was at this period in the history of world and local events that the Catholics of Scarborough decided that the time had come for them to think of building a church. There were in the township, in the neighbourhood of 4,000 inhabitants. John Torrance was Reeve that year; William Clark, Deputy Reeve, the Councillors were George Stephenson, William H. Norris and Thomas Kennedy; the Treasurer was William Helliwell and the Clerk, Stephen Closson. It was a township of well-ordered farms, presenting a very different picture from the one seen by the early settlers who followed the road through the forest from the new capital of York more than fifty years before. In the last years of the Eighteenth Century, when the first settlers, David Thomson built his log house on Lot 24 of the First Concession, there were few Catholics in the section of Upper Canada now in the Diocese of Toronto - then included in the vast Diocese of Quebec, and there was no Catholic Church. For almost a quarter of a century, the clergy who visited the scattered settlers, said Mass and held devotions in the homes of the faithful. St. Paul's, the first Catholic Church in the town of York, was erected in 1822 and the priests who served here also visited the surrounding townships. These visits would not have been very frequent for the few priests then in the Diocese had enormous territories to cover. It is possible, of course, that Scarborough being fairly close to York, was visited a little more frequently than some of the other townships, or that the few Catholics in these parts journeyed to St. Paul's from time to time. In 1819, the Reverend Alexander Macdonell, a Scottish priest and a Vicar General of the Diocese of Quebec, for Upper Canada, was named Auxiliary to the Bishop of Quebec and Titular Bishop of Rhesaena, and in 1826 Upper Canada was erected into a separate diocese and Bishop Macdonell was named first Ordinary with the title of Bishop of Kingston. As Vicar General and later as Bishop, he made many missionary tours through the country which is now the Province of Ontario. The following are some of the priests most likely to have made missionary visits to Scarborough in the years following the building of the church at York. They were stationed either at York or appointed to visit the outside missions. Reverend James Crowley, first resident pastor at York, arrived in September 1824 and remained until March, 1826. In May 1827, the Reverend Angus Macdonell, nephew of the Bishop, was sent as pastor of St. Paul's. In August of 1828, Reverend William J. O'Grady came to York, at first assisting Father Macdonell and then being named pastor and later Vicar General. We learn from a Register of the Baptisms performed by the Reverend Edward Gordon in the Townships above York, during his mission of three years and five months, that he performed a baptism in Scarborough on January 20, 1833, that of James Cavanagh, son of Francis Cavanagh and Lucinda Jones, sponsors being Daniel Doyle and Jane Mullin; but most of Father Gordon's missionary labours were, as he said, in the Townships above York. A list of these places gives some idea of the distances he had to travel; York town and township, Toronto township, the Gore of Toronto, Etobicoke, Vaughan, Markham, Scarborough, Whitchurch, East Gwillimbury, King, Tecumseth, Adjala, Trafalgar, Streetsville, Holland Landing, Thorah, Brock, Georgina, Newmarket, Esquesing, Chinguacoucy, Caledon, Mono, Albion, Niagara, St. Catharines, Lake Simcoe, Deep Cut, Mara, the Narrows (Orillia) Mulmer, Dundas Street, Yonge Street. What a job a parish priest had in those days! Reverend William P. McDonagh, who came to York in September, 1833 and was stationed at St. Paul's for several years, wrote to Bishop Macdonell at Kingston in March, 1837: "I have taken the census of this place as correctly as I could, the total amount between males and females is, two thousand one hundred and nineteen. There are upwards of one hundred and fifty in Whitby and Pickering, whose names we have not got as yet, until some reasonable opportunity offers for going to those distant Townships." 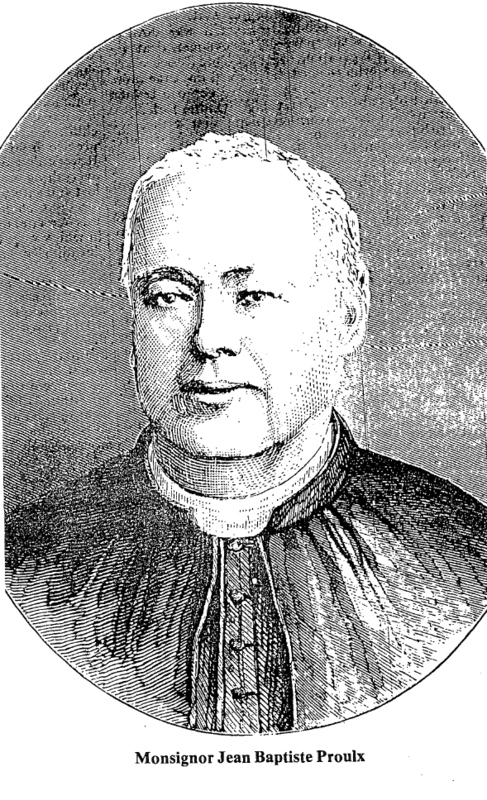 Father Thomas Gibney, writing in the following month, remarked on how busy he and Father McDonagh had been during Lent and reported that while he had not had time since his arrival to visit the townships between Toronto and Port Hope, that Father McDonagh had paid these townships a visit. The Reverend Michael R. Mills, sent by the Bishop in the summer of 1838, to make a missionary tour of the townships around Toronto and Lake Simcoe, reported as follows, "I send an account of the number of Catholic inhabitants of the different townships which I lately visited and I am happy to say that all, except perhaps about ten, have been to Easter Communion. The above I believe tolerably correct. I know that I am not above the mark."